Oct. 29, 2014, 11:49 a.m. Oct. 29, 2014, 11:49 a.m.
Should I let my tenants have fireworks or a bonfire at my property? 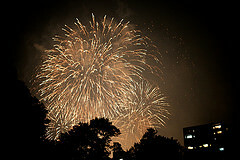 ‘Fireworks ‘image used with Permission of MIKI Yoshihito, under creative commons on Flickr. November 5th is fast approaching and with it, a spree of firework displays and back garden bonfires. But the question for landlords, is do you allow your tenants to hold their own displays at properties they are renting from you? The fire service recommends members of the public attend officially organised displays rather than staging their own, but it is perfectly legal to set off fireworks on private property – providing it is before 11pm (except on designated holidays). Read Greater Manchester Fire Service’s firework safety tips here. To gauge public opinion on the subject, we asked some landlords for their views. John Diver, from Birches Head, does not see the harm in allowing his tenants to hold their own display. “The way I see it, deposits are there for a reason, so if something goes wrong, I’m covered. “I also think you have to trust your tenants to a certain extent and allow them to treat your property as their own home. But Dawn Ellis, from Frodsham, said her decision would depend on the location of the property. “We have a property in the countryside and we probably wouldn’t mind the family who rents it having a small bonfire and some fireworks, as there are very few neighbours they could disturb. George Vickers, from Lymm, also believes the situation must be approached on a case by case basis. “Obviously if it’s a house of students I would be more wary, but if it’s a family who have been renting one of my properties for some time I’d be more inclined to allow it. Insurance Revolution account manager, Jason Lawford, said: “In the event of a house catching fire due to a bonfire getting out of control, the majority of insurers would cover this under the fire peril of the landlords building policy. “If a tenant let off fireworks in an irresponsible manner, resulting in damage, this would be excluded under the policy if it was deemed as malicious damage by the insurer – unless the landlord has specifically requested malicious damage cover by tenants. “However, some underwriters stipulate that the landlord would have to notify them before the commencement of such an event.